That was great, nice clips and funny ones too :D Liked the music choice also. Rock on! Great montage! I loved the clips in that first song tons of sniper pistol which is my favorite to watch. I could tell you had a smart play-style from some of the clips: using cover to survive with 1 red & sliding to survive the big fall on dammy. There were some plasma sticks and double melees for variety. More props for having a good map mix. I was pleasantly surprised by this. It was a great watch, good job buddy. Good stuff hasuku! Glad to see you're making some ce vids! Nice to see a tage from you man. :) loved it. 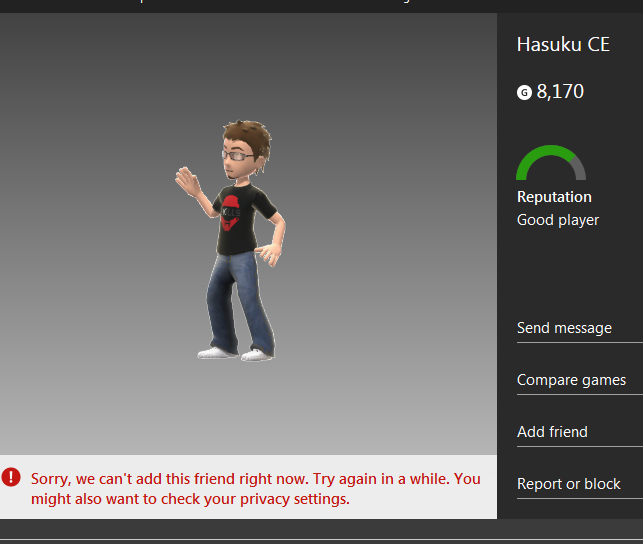 What's your new gamertag? You should add me. Thomasxp5 said in I made a montage. josh1337 said in I made a montage. "I didn't like some plays that seemed unrealistic like sitting in the chill-out window with sniper out or throwing 4 plasma nades into dammy sniper room waiting for one to stick." Yeah those were clips that i got in matchmaking that i thought were more on the humor side, which is why i put them in the fails, etc portion. l Hasuku l said in I made a montage. I've gotten this message serveral times with different people, why does it say that? I tried looking at my privacy settings but I don't understand what the problem is.